Well, graduation season is upon us. I have to tell you, making this playlist made me quite sentimental, and I don't have anyone close to me graduating from anything. I think it just goes to show how special graduation time is, and the memories of it will last a lifetime. I can still remember the feelings I had the night of my high school graduation, and it's been more years than I care to admit! Such a fun time of life. I'm really happy with where I am in life, and wouldn't want to go back to high school (well, maybe for a day) but I can't deny those were some of the best years of my life. I look back with very fond memories of everything I did, friends I made, and experience I had. A time of life like no other, and it's definitely worth celebrating when it's all been said and done. I hated to leave high school, (a lot of you probably think I'm crazy) but really I had no idea what was in store for me. There is plenty of life ahead, and many more wonderful memories to be had. But to all the graduates out there, relish these last few days! You'll remember them for the rest of your life! I have a bit of everything in this playlist. 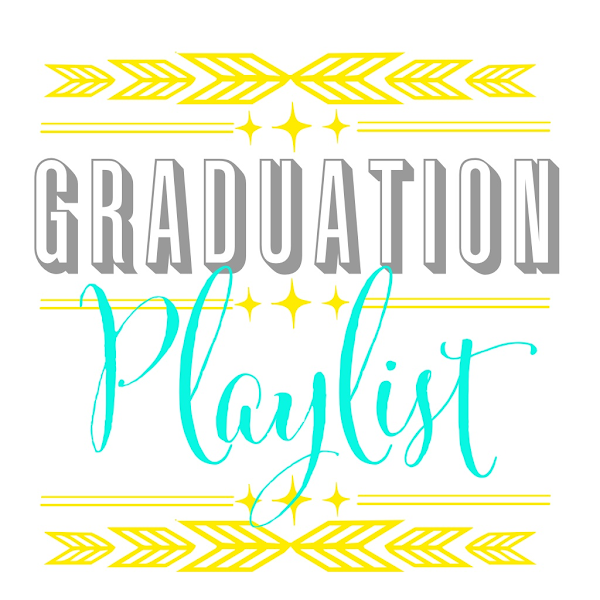 It's not graduation without Pomp and Circumstance, and I have a few sappy songs like Friends from Michael W. Smith, and some very upbeat ones like (I've Had) The Time of My Life. I hope there's enough variety that you'll be able to find a few songs that fit you and your graduate. Just like all my other Spotify playlists, if you have a Spotify account (it's free!) you can hear my entire playlist when you're logged in. And, incase you're in need of a quick and easy graduation gift, I have a printable just for you. You can never go wrong with Dr. Seuss quotes! I also have this quote in pink and yellow, so you can choose which color fits your graduate best. Congrats to all the grads out there! 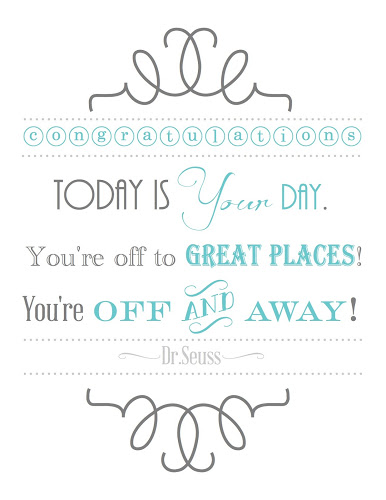 Just as Dr. Seuss says, "You're off to great places! You're off and away!" Enjoy! I love your playlist. Thanks for sharing it. My daughter graduates from high school in our summer in December so I will pin this post for later. My Say G'day Saturday linky party has just started and this would be a great post to share. Please pop by and say g'day if you have a minute! While you are there you might also like to share this post at my weekly Tuesday Tune linky party which is also on now! So glad you like the playlist, Natasha! Graduation is such a special time. Enjoy your daughters! Have a great weekend! Graduation (Friends Forever) gets me every time. I would love it if you joined and contribute your awesome posts at my link party at City of Creative Dreams starts on Fridays :D Hope to see you there at City of Creative Dreams Link Party. Graduations Time is excitement period of a human. I can also remember this. It is really awesome. Thank you so much for your great share. Pretty blogging. I love your blogging. Keep writing man.